I am fully aware that this post is long overdue. I figured I owed it to everyone to get this one out there first and then I can do a catch-up post for all of the other happenings in my life. In order to keep this from being the longest post in the history of blogger, I am splitting up my visit into a few different blogs. But first, a disclaimer. More than a year ago I found Raven's blog through a couple of other blogs that I follow. I have to be honest, at first I wasn't hooked. 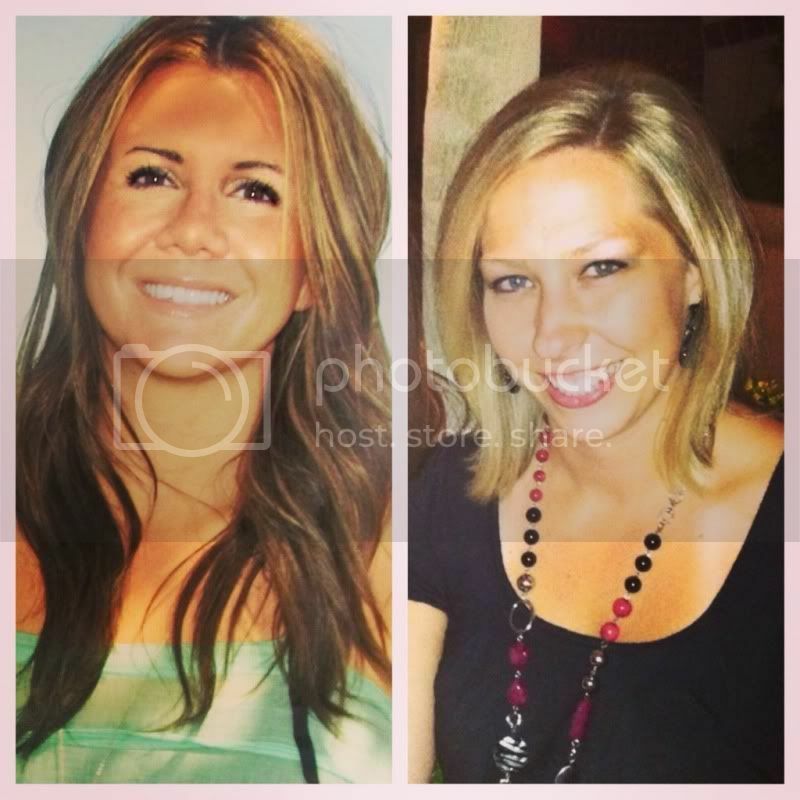 A mommy blogger that I probably didn't have anything in common with? No thanks. But, one day I read a guest post she did on another blog and I thought she was pretty funny, so I added her to my reader and gave it a shot. A couple of months later, I added her on FB, and one day I decided to say hi via chat. I didn't even introduce myself, I just jumped right into a conversation like we were already friends. Weird? Maybe. But who cares? I never mentioned it on here before I left because I knew I would get some flack from my family and friends, especially those that don't blog. People who don't blog never understand. People who date online understand a little bit more. I liken it to a pen-pal. We all had those when we were little, whether they were in other states or other countries. The internet just makes things easier. If you think about it, when you very first meet someone, you don't know them at all. You don't know anything about them. Maybe you meet through mutual friends, but how well does your mutual friend know them? I mean, it's not like I went to visit her a week or two after "meeting her". It was a year-long courtship. JB thought it was weird at first, but every night he saw me giggling and texting and would say, "How's Raven?" and would sometimes get jealous that I was texting her all night instead of hanging out with him. He trusted my judgement and knew that if I thought it was fine, it was fine. 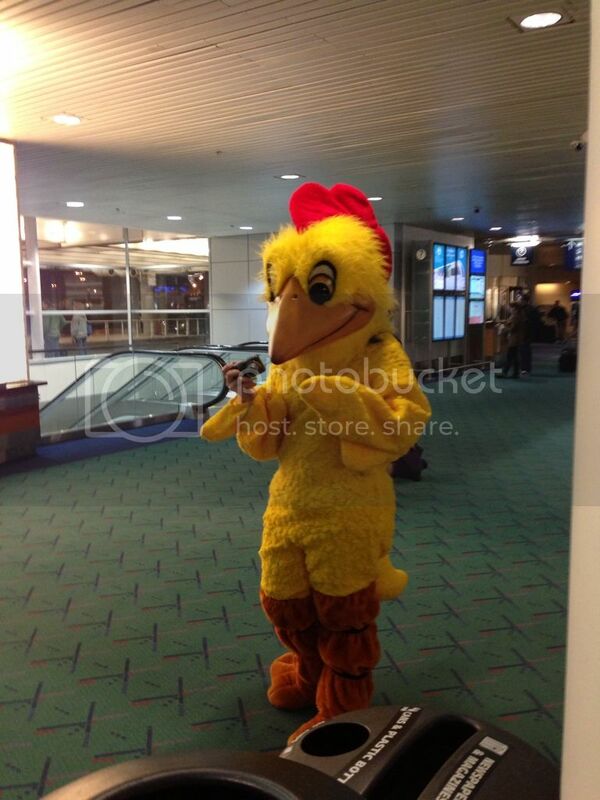 As soon as I came down the escalator and saw the back of a chicken suit, I knew it was her. 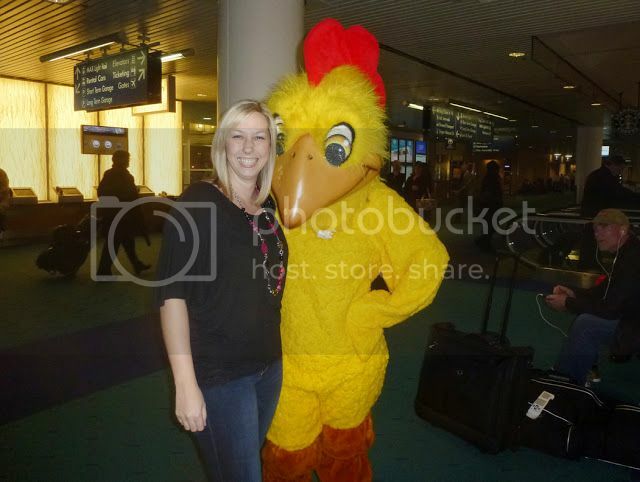 She was mad that I knew, but come on, who else would be cuckoo enough to wear a chicken suit at the airport? Besides that, I didn't see her anywhere and I knew she had been there for a while. When I walked up to her, there were people asking her to take her picture. She was pointing a camera at me like a freaking stalker, but wouldn't say anything. She wouldn't take off her chicken head until I threatened to hug her if she didn't reveal herself. Since my free Southwest flight didn't fly into the airport closest to her house, I flew into Portland and we had a 3.5 hour drive to get through before we could even socially lubricate ourselves with a drink. 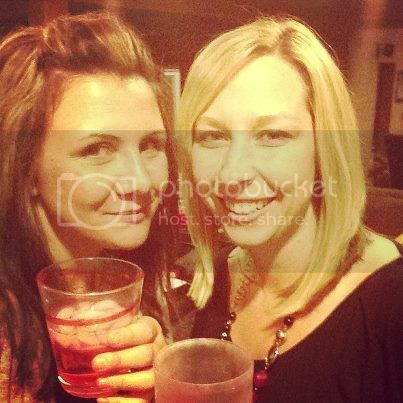 The time seemed to fly by and before I knew it, we were at her sprawling mansion house with a drink in our hands. We had to take G-Man to school in the morning, so after saying hello to her handsome husband, Rob, and having a drink, we called it a night. A few things I have issues with. FIRST AND FOREMOST, at first you weren't interested in my blog? In MY blog? IN MY!!!! BLOG!!!??? Blasphemy I say, blasphemy!! Two, Rob appreciates you called him handsome and not "grandpa." Three, you didn't tell everything that I was even more stunning in real life.